Four friends and I created WIMSical as part of a 24-hour hackathon in high-school. It was the first hackathon I had ever participated in, and I can proudly claim credit for the concept of the service. The website was created using Google App Engine, and is still live, although only the Google-based login still functions. The site’s code is on Github. The idea is that you can set your phone or laptop’s lock screen to be the QR code. 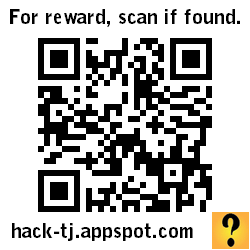 When a stranger scans the code with their own phone, they are brought to a page that tells them about the reward for returning the device. As the owner, you receive notification when someone finds your device and can contact them using the information they provide.